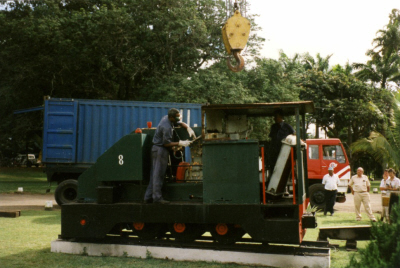 In September 1996 members of the Greenwich & District Narrow Gauge Railway Society (GDNGRS) met Olivier Jaubert, a French narrow gauge railway enthusiast whose work took him to sugar estates in Africa and Mauritius. He made enquiries which led to confirmation of 4415's continued existence and an approach to its owners regarding possible repatriation to the U.K. With the help of M Jaubert agreement was reached with the owners (Mon Tresor et Mon Desert Sugar Estate) to present the locomotive jointly to the GDNGRS and the Ffestiniog Railway. The then General Manager was Monsieur Tursan d’Espaignet. He was close to retirement, and that was our chance! He gave us the locomotive against a certificate that both the Greenwich Diesel Group and the Festiniog Railway were non profit associations / charities, and I must say that both associations sent me such a certificate by fax the very same day I asked for it. To obtain 4415, I must have been quite persuasive. I got it partially because, as Mr Monsieur Tursan d’Espaignet gave me to understand, he was retiring a few months later, so his South African shareholders/general managers would not be able to “punish” him for giving a company’s asset as a gift to unknown associations far away. Were he a young manager looking for a glittering career inside the Company, 4415 would not be in Wales today! The one person who was dissatisfied was M. Pilot, the engineer who had saved the loco and liked to see it on its plinth from his office window every day. As he said, ”I was so polite and helpful to that railway fan who came to visit me and talk about my locomotive. Now, a few months later he is back to take it away!" And frankly, he told me he was shocked that I, a Frenchman, was helping the British when almost all white people from Mauritius like himself were of French origin! 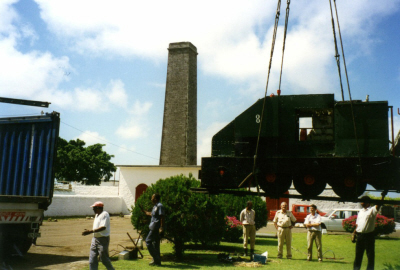 You will understand better if you know that when the very last standard gauge train on Mauritius ran in 1956, it had two flags on the locomotive - one British, one French. Yet Mauritius had not been French since 1810, and that last train was 146 years later. What is more, back in 1810, the flag was actually Napoleon’s flag! 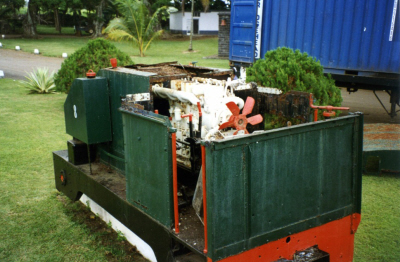 On Monday 27th.August 1997, Kerr Stuart 4415 was lifted from her plinth and loaded into an open container with those parts which would have projected above the sides (such as the top of the cab and the large cab-mounted radiator) removed and stored at one end. Someone who had given some thought to shipping the loco over the high seas had tack-welded it to the track on which is stood. 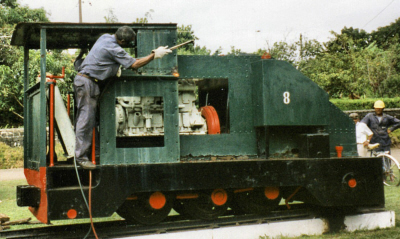 Unfortunately this was not enough to prevent the loco moving; the tack-welds gave way and the loco rolled along the track, crushing the cab & other parts. More embarassingly, the container doors were also noticeably damaged. 4415 re-entered the UK at Felixstowe and arrived at the FR's Minffordd yard on 26th October 1997.